hFM stands for heart-guided Frequency Modulation. In vibrational medicine, there are what are called frequency windows of specificity, in other words certain frequencies / wavelengths that can jump-start or unlock the natural healing potential present in our body-minds. For whatever reason, that connection and healing capability can contract or armor itself when faced with various traumas and life situations. Vibrational techniques excel at unlayering and revealing truer parts of ourselves. In sound and electromagnetic modalities, frequency generators of various types have had a long history of use. For an excellent overview of this, see James Oschman's book, Energy Medicine - the Scientific Basis. Natural frequencies found in the body are seldom pure tones or single frequencies. There is variation and flexibility. The downside of entrainment to pure tone frequencies is that it gives the physiology little latitude to dance or experiment around the tone that is being provided. hFM is a (very) simple audio frequency tone generator with several "adjustment knobs". The most obvious knob controls the base (carrier or fundamental) frequency in hertz that is being provided. A second knob adjusts the maximum percentage of modulation (+ and - hertz) of a randomized signal that will be used to frequency modulate the base frequency. (The modulation varies from zero to the maximum, on a random basis). The third knob (in hertz) adjusts the "change rate", that is how many times per second a new random modulation (frequency) is chosen. The resulting randomized frequency can be applied to the client, via either headphones, speakers, subwoofer, or hand-held-woofer. By using the wisdom and guidance present in the pulse, you can determine each of these numbers in turn (base freq., percentage modulation, change rate). This is done using the HIGS system. Basically it is as if you were muscle testing or dowsing for each digit (from 0 through 9) of the numbers that we are obtaining. However, contrasted to kinesiology or dowsing, HIGS can provide an immediate and quick readout of each digit in as little as a few seconds (per digit). The hFM "program" is actually a software patch "circuit" that was developed using Andy Turner's exceptional and award winning Analog Box 2 program. It's a software synthesizer controlled by patch cords hooked between modules. When you "run" the hFM program, you are actually telling abox2 to "execute" that circuit/program. Various on-screen knobs and buttons are used to control the circuit. HIGS stands for Heart Intelligence Guidance System, a way of reading out information from the intelligence and wisdom source present in the heart and pulse. It is an extension and further development of the work of Dr. Paul Nogier, who invented a system of pulse reading (in the 60's) known as the VAS, Vascular Autonomic Signal. HIGS is especially useful in the field of vibrational and energy medicine. Many times the practitioner wants to know, what is the best frequency or color to use in this situation? How can the vibrational toolbox be most skillfully sequenced to unfold and reconnect energy in a gentle and optimal manner? This is what HIGS does. By accessing the wisdom source and spirit connection that is present in the client's heart and pulse, it allows the practitioner to ask precise questions about which instrument to use, settings in hertz or nanometers, duration of treatment, etc. It can act as a guidance system for the use of your toolbox. The abox2 program is written for Windows only. I asked Andy about this once, wondering if it could be ported easily to Mac OS or Linux. He told me that the code is all written in assembler and makes direct graphics system calls on the Windows OS. So in layman's terms that means Mac or Linux versions are unlikely to appear. Abox2 will run on any Pentium system (with MMX), 200+ MHz speed, and a sound card. It doesnt really need much horsepower, because it is so efficient. Windows version 98, NT, 2K, XP, Vista, etc. 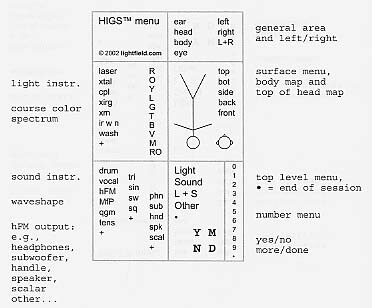 HIGS uses a "menu card" to readout information and answer questions. Basically your hand-eye tracking is watching the motion of a small pen or pointer as it moves over the choices in the menus there. Simultaneously, your other hand is monitoring the pulse response of the client to these "questions" that you are asking energetically. This is not too different than the case of the muscle tester who is silently saying inside to themselves "is it this flower essence, or this one, or this one? ", and simultaneously monitoring the muscle response of the client. The practitioner is not "announcing" each choice the the client. In effect we have a linked two-consciousness system. HIGS operates the same way, but with a pencil / pointer / pulse based system. There is really nothing to "install" with abox2. Just visit the download link at Andy's site, and grab the zip file. Unzipping that on your machine will show the executable, ABox999.exe (where 999 is the version number, currently 240 in April 2011.) Drag the ABox___.exe to your Desktop or somewhere convenient. Double click on the ABox program. This will start the program and also setup file extension settings in the registry. To use the hFM circuit with abox2, continue reading below. Download this file, it is the hFM circuit: hFM.ABox2 . This is the circuit (or program) that defines the "heart-guided Frequency Modulation" generator. Double click on that file. This will start ABox2.exe with hFM as the circuit. Resize the window so you see the entire circuit. Shown above at top of page. Here is a brief description of what you see on the screen: Over on the far left upper corner is a circular blue "knob" that controls the base, (or carrier or center) frequency (in hertz) that we are generating. This is the center frequency around which the random variations will be applied. Knobs are most easily changed by right clicking on the knob, then typing a numeric value in the box, such as frequency in hz or a percentage for the modulation knob. As soon as you right click the knob, a control box will pop up showing various settings possible with the knob. You can ignore most of these, just look at the selected text in the upper left. This is the current knob setting in hertz or percent. Since the entire text in the field is selected, to replace with a new value, simply type that value. For example type "42.1" (omit the quotes) in the carrier frequency box to change the frequency to 42.1 cycles per second. The text field also contains the units ("Hz") and "gear ratio" of the knob, but these are just for informational purposes. By typing a simple numeric value you preserve the previous units and gear setting. Knobs can also be altered by left clicking in the center, then "rotating" the knob by keeping the left button down, and making "circling" motions AROUND the knob. But that is usually the "hard" way to set a value. However it does allow you to sweep a value up or down gradually. You can get more resolution in the turning mode by moving farther away from the center while holding the left button. This increases the length of the "lever arm". Each knob has both an inner knob (center) and outer sleeve. The center knob is scaled by the gear ratio, whereas the outer sleeve is unscaled. The next blue knob below carrier frequency adjusts the "percentage modulation", that is, how many percent above and below the center frequency, the carrier is randomly modulated. The knob units are in percent of the carrier freq. Just to the right of this knob is a readout, showing the final modulation amount in hertz. This is just for reference. Typically percents used with clients are in the low range, say 30% or below, sometimes only a few percent. I havent seen any percentages anywhere near 100%, this would be a wildly varying waveform, too chaotic. The lowest blue knob adjusts the "change rate", that is, how many times per second the random changes are applied. Units are in hertz (changes per second). All three of these values should be determined by HIGS, muscle testing, or other means, before you start the circuit. The circuit operation is started with the "Play" button on the top of the window. Alternately you can use the spacebar to start or stop the playing. While the circuit is in operation, several displays are being updated. The lower right corner of the screen contains an "FFT graph", a fourier transform plot showing frequency on the horizontal axis, and amplitude on the vertical. Orange line shows the current frequency distribution, while green shows a time average of previous values. So you can see the random modulation is moving the frequency above and below the carrier value. The next plot up, is an oscilliscope trace, orange showing the resulting wave output shape and green shows the amount of randomicity applied (+ or -) to the base frequency. On the top right is a numeric readout showing the "final out freq" instantaneous output wave cycles per second (hertz) as it varies about the center frequency. If you look carefully you can see that the maximum and minimum values correspond to the carrier frequency plus a random offset in the range + or - "modulation in Hz". As distributed, the "~Move" (do not allow moving objects) button is depressed, meaning that different knobs and components are in fixed positions and less likely to be accidentally disturbed. Also, the default setting for ABox2 screen update speed is "Slow", meaning the wave shapes and FFT are only repainted a few times per second. You can click this button and it will change to "Fast". There is no effect on the audio output, this only controls the screen refresh rate. The triangle wave shown in the green oval just to the left of the oscilliscope, shows that the current waveform is of type "triangle". This is generally a good choice (used by many sound therapies), because the harmonic content is pleasing and richer than sine wave (the single pure tone we talked about earlier). You can ask the client's pulse which type of wave it prefers, if you wish. In addition to triangle, sine, square, and sawtooth (ramp) waves are available. Sometimes with the hand-held-woofer, ramps are effective at sub audible frequencies. Three types each of square and ramp waves are available (#1 [lowpass filtered], #2 [frequency limited], and #3 [digital]). You can select the wave type by right clicking on the green oval (near the scope). Be sure to only change the waveforms, leave the freq / phase button alone. I am assuming now that you have read some of the HIGS manual and understand that the menu card is a "hierarchical" menu system. The top level menu can be used to ask what type of instrument (light, sound, light+sound, or other). Then we can ask which instrument, which location, settings, and so forth. This can be a general guidance system for the vibrational tools in your toolbox. So I encourage you to tape over, edit, or otherwise change the HIGS menu system to better suit your own toolbox and working styles. For example instead of my list of sound or light tools, you would substitute your own list(s). The boxes on the card are the size of 3M postit notes, to allow this kind of customization. I use HIGS this way, and simply follow the directions the heart is indicating --of course as I am communicating with the client and checking in to see what is going on. I like to ask, "where are you feeling this in your body" -- what kind of energy movements and openings are you picking up and how do they change? This allows the intellect to step a bit to the background and just be in the present moment, tracking the feelings. It also allows emotions, gestalts, intuitions, imagery to arise without prejudgement on the part of the mind. So I would use hFM in this context: only as it is being asked for in the course of your session, as it is appropriate. It is GOOD to use varied and different tools (e.g., light, sound, voice) in the course of the session because the energy system is multidimensional and multifaceted. Important concepts related in the manual are that of "more" vs. "done", and "end of session". While you are doing a balancing with hFM or other instruments, always check in periodically to ask, "do you need more of this" frequency, color, tool, or "are we done" with this adjustment. This way you know when the bioinformation has done all the work it is capable of doing. And you also don't take longer than you need to on any single balancing step. The top level HIGS menu contains a "bullet" symbol (large period), and this means "end of session". As you are going thru the top level menu, asking which class of tool to use for the next balancing, if the pulse indicates "end of session", then indeed this is all the balancing the client can use at this time, and it is better to stop at this point -- even if the session is of fixed length and you have more time at the end. This time is better spent quietly in integration, than trying to overload the client with too much information or too many balancings. On the HIGS menu in the sound section it shows a range of output devices that can be used with hFM. That list includes headphones, subwoofer, handle-woofer, transducer, speaker, scalar coil, etc. See which one the client is prefering. If it is a movable device like the handle-woofer -- see which location you are working at. You can also use the pulse to fine tune the distance from the body and X and Y position over the body area. If headphones, you can ask, is this left-only, right-only, or both at once. You can use the "Wave balance" control on your Windows sound control panel to adjust left/right balance. (Right click on the speaker in the lower right Windows tray, Open Volume Controls). You might also check your general level settings while here, I would set all at max or near max. Use headphones that have a volume control on the cord, so the client can self-adjust. You might ask, what is a "handle-woofer": this is the subwoofer, shaped as a handle used in devices like the "QGM - Qigong Machine" -- invented by the Chinese woman scientist and acoustic engineer Dr. Lu Yan Fang. 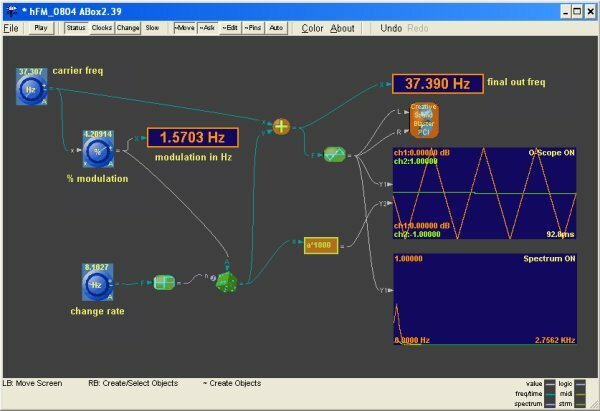 The QGM generates a random spectrum with the dominant frequency of 10 Hz. This distribution was noted coming (in a lower level audio form) from the hands of qigong teachers as they were sending "emitted qi". The QGM has been found extremely useful for many conditions of pain and energy stagnation, it is used widely in clinics around the world. The handle from the QGM is a very useful applicator of low frequency audio waveforms. One place to get one is to just borrow it from your own Qigong Machine. You can get the "original" flat-top QGM (analog, not digital) from Insight Publishing (QI Journal), at $359, 800-787-2600. There are also a number of other small subwoofer options available now, such as the surplus units available by AURA (Bass Shaker) that are very inexpensive. Clark Synthesis makes transducers, but these are somewhat larger and may need a support arm if placement on client body locations is desired. These type of units are commonly employed in sound tables. But in that case the fixed position can be a limitation. Similar transducer handles are used on the equipment from Sir Peter Guy Manners, now Cyma. Once you have a subwoofer, just hook it up to any amplifier / receiver you have around (with the sound card output into line/aux in). The impedance usually matches audio speakers, be careful with your volume control so that you don't OVER drive it. The level setting will change depending on output center frequency. Subwoofers only have a limited range of frequencies they cover. DO NOT attempt to drive the subwoofer direct from your sound card, you could blow out your sound card; it takes too much power to physically move the heavy voice coil.